WHAT THE STRIKE WAS REALLY ABOUT. USA Today carried our CEO’s commentary about what’s really at the heart of the strike. “It is about a union losing membership as a result of the freedoms finally restored to teachers by the U.S. Supreme Court case Janus v. AFSCME. It is about a union protecting a status quo that’s not working for teachers, parents or students who want flexibility, access to path-breaking innovations and improved opportunities no matter where they live.” As we argue here and everywhere, instead of rallying for a massively outdated system, educators and parents should fight for schools that work for children. SO IS THIS. Education Reimagined’s Director Kelly Young joins Jeanne Allen on Reality Check this week to discuss the need to reimagine and refocus on the way young people are educated and stay lifelong learners throughout their time as a bona fide student, as well as beyond classrooms in the workplace, and continuing as an individual among the many people of the world. Young takes listeners through Education Reimagined’s mission and the relationship between competency and a learner-centric model, why it’s so important for the future of school and work together, and what it means for the future of America. VIRGINIA IS FOR LOVERS? Today, Virginia teachers are also being led to follow the lead of their comrades in other states as they walk out on kids and education in an effort to draw attention to poor pay scales. But as we have argued, public education is mis-funded, not underfunded. States and districts allocate funds based on programs, not students. Funding is mandated by rules and laws that remove any authority for the allocation of dollars to the people closest to our kids. The teachers need to be asking themselves, their leadership, unions and policymakers where the money is in order to truly understand what must change. If you want to solve the problem of teacher pay, reimagine education. Only when funds follow students will teachers reap the rewards they sow. CAPLESS IN SANTE FE: Clearly taking a page out of the anti-charter, establishment playbook, a proposal that would have capped the number of students at charter schools has died in the legislature. The idea to limit enrollment to 27,000 students was designed to better even out state funding. While charter schools serve about 8 percent of the state’s public school students, they’ve received 55 percent of new school funding in the last few years. What isn’t reported are existing funding inequities and the already current cap of no more than 15 schools authorized per year. CITIZENSHIP TEST REQUIREMENT FOR GRADUATION MOVES FORWARD. The Indiana State Senate became the first legislative chamber to approve a bill mandating passage of the U.S. Citizenship test in order to graduate from high school. The bill passed 31 – 17, and if as expected the Assembly also approves, Indiana will be a trailblazer in this idea, which is gaining currency across the country. South Dakota Governor Kristi Noem was the first elected official to suggest this idea, and her legislation is currently pending in Pierre. This is a great move. If you’ve seen the test, you know it seems to require more from new citizens than we require of students. EUREKA, “I found it!” could be the motto for innovative higher education, as well as the moniker of Eureka College, whose students are part of an effort to provide greater access to higher ed regardless of your institution. 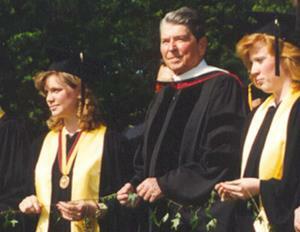 Eureka, President Reagan’s alma mater, takes part in online course-sharing among members of the Council of Independent Colleges (independent liberal arts colleges who have banded together to share course and tuition revenue when students take the courses) all the while improving retention by helping students fill gaps in their transcripts. In the words of one Eureka student, it allowed him to “take a management course online from William Peace University and an online American government class from Jacksonville College, in Texas. I live on a farm, and we show animals and such, and this gave me the opportunity to work” while keeping up with class”. New student-centered learning and approaches – just the ticket to a successful future.